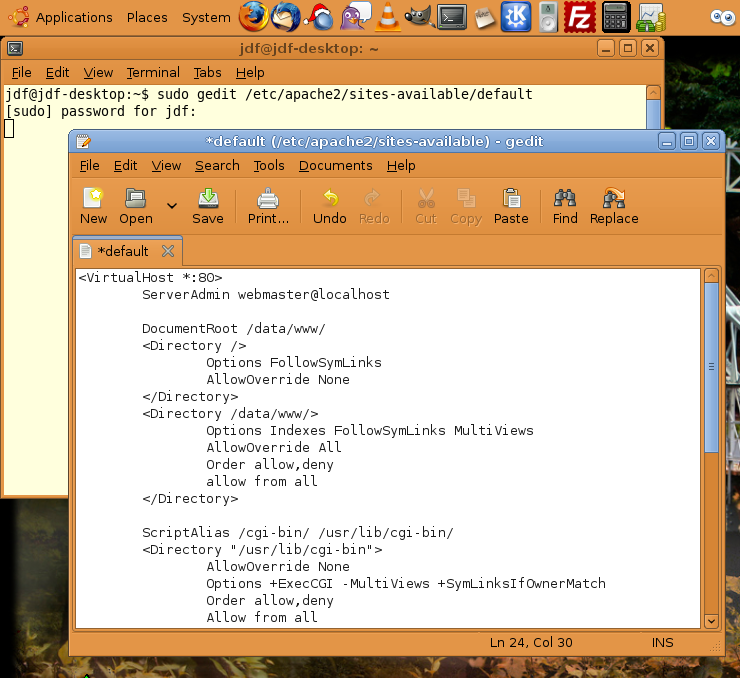 Ubuntu is an intuitive Linux-based operating system that is easy to switch to from Windows. The operating system and almost any software you will ever need is available free of charge. You can get Ubuntu by visiting www.ubuntu.com, where you can download the software or request a CD be mailed to you. For fun, and for profit, I design and code web sites, so I like having Apache web server software running on my machine. I can easily test changes to web sites by modifying the local code and browsing to “localhost” in my browser instead of uploading a new copy of each file for every change that is made. If you work with HTML, xHTML, CSS, PHP, or other web-based technologies, running a local server will greatly increase your productivity. Ubuntu makes installing software a breeze. Being based on Debian, it includes the Synaptic Package Manager, which can be used to search for and install software packages. But if one knows the name(s) of the specific package one wants to install, the command-line apt interface is quicker. 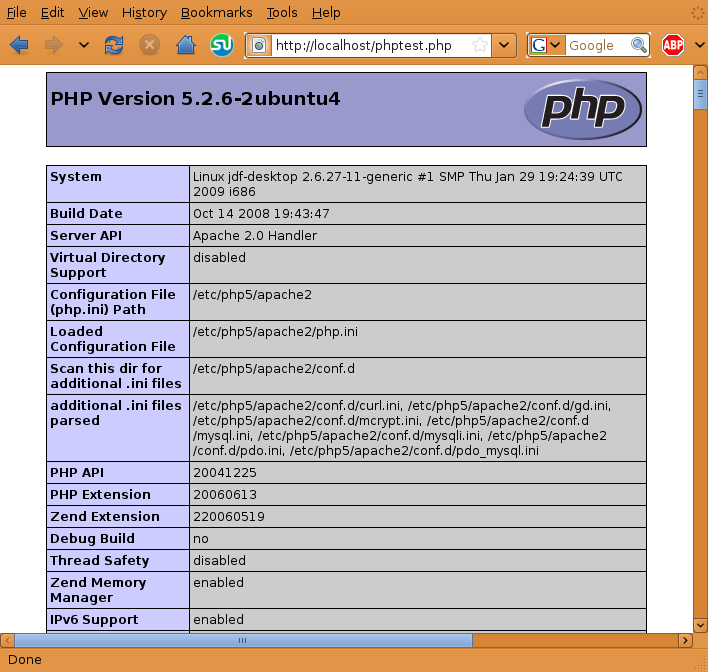 In this article, I will walk you through the process of installing Apache2 web server with PHP support. Some of this software is available in the extended “universe” software repository. This may not already be enabled on your computer, so go through the following steps to ensure the software will be available for you to install. On the menu bar in Synaptic, click Settings, Repositories and make sure the box next to the option for “universe” is checked. Other software you are bound to want in the future will require the “multiverse” repository, so you may as well enable it while you’re here. Alternatively, you can do this in terminal (command-line) by using this method. Now you are ready to install Apache. Open a terminal window, either by choosing Applications, Accessories, Terminal, or by pressing ALT+F2 (run) and entering “gnome-terminal”. The sudo portion runs the apt-get command as a temporary administrator action, and as such requires the administrator password, as above. This will install all libraries necessary to run Apache. You will likely have to press the Y key to accept the install. Once these changes are made, save the file by pressing CTRL+S or clicking File, Save; close the text editor. Google for more information on these modules. I recommend installing at least rewrite. Then navigate to http://localhost/phptest.php in your web browser, and you should see a readout of information on your PHP version. Your local web server is now up-and-running. Use it to create an intranet for your work or home network, to quickly test web site changes without having to upload to your web host after each modification, or install a dynamic DNS package (like noip2 with a www.no-ip.org account) and serve live websites from your local computer! Entry filed under: Ubuntu, Web. Tags: apache, cgi, php, Ubuntu, web server. That is very helpful and details step by step guide. You are very welcome. I have since added more images and details to make it more complete. I hope this helps others, too.